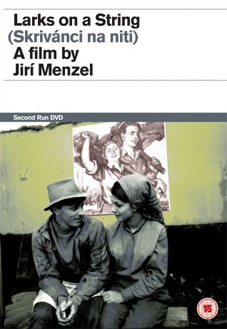 Filmed in 1968 whilst Czechoslovakia enjoyed a brief moment of political liberalization, Larks on a String (Skřivá́nci na niti) (1990) is a searing political comedy from director Jiří Menzel and writer Bohumil Hrabal. Like their 1966 Oscar-winning triumph Closely Observed Trains (Ostre sledované vlaky), it audaciously combines black humour with grim reality. Set in a scrap metal yard where political dissidents are interned to be re-educated, the film is both a powerful critique of totalitarianism and a celebration of the resilience of the human spirit. By the time Larks on a String was completed, the Soviet invasion had restored a repressive Communist regime. The film was promptly banned and remained unseen until 1990, when it was finally released to great acclaim winning the grand prize at the Berlin Film Festival. Menzel's collaboration with Bohumil Hrabal lives on in his most recent film, the rather wonderful I Served the King of England (Obsluhoval jsem anglického krále), being also based on one of the writer's novels. Booklet featuring introduction by DoP Jaromí́r Šofr and new essay by author and film programmer Peter Hames.